Sony has launched a new powerful flagship flash with a guide number of 60, the HVL-F60RM Flash. The connected flash has a built-in 2.4 GHz radio transceiver to allow photographers to quickly and easily create portable, wireless flash setups. There is full support for P-TTL and Advanced Distance Integration (ADI) metering as well, even when used in a wireless flash setup. The HVL-F60RM can be used as a commander or a remote and you can establish a connected set of up to 15 flashes across 5 groups. Compared to its predecessor, the HVL-F60M, the new F60RM flash not only adds the radio transceiver, but it also has improved overheating protection and more reliable performance. The guide number at ISO 100 and 105mm is 197' and the flash can recycle in as little as 1.7 seconds - or 0.6 seconds with the new external battery adapter (FA-EBA1). Further, the flash head has -8 to 150 degrees of tilt and 180 degrees of rotation. The zoom head has a normal range of 20-200mm but it can be widened to 14mm with an included pull-out diffusion panel. The flash has a new front-facing LED light which can be used as an autofocus assist illuminator with E-mount mirrorless cameras and the flash has a weather-resistant construction and metal foot. 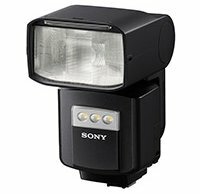 While the AF illumination feature is limited to E-mount cameras, the new flash is compatible with the Sony A99 II in addition to the Sony A9, A7R III, A7R II, A7S II and A6500. Getting further into the nitty-gritty details, the new Advanced Distance Integration (ADI) metering works with lenses that have built-in distance encoders and it balances the flash output with ambient light by taking camera-to-subject distance into account. Further, the built-in LED light has an output of 1,200 lux at 1.6 feet (0.5 meters). The flash can produce 220 full-power flashes per set of batteries. To preorder the new flash, which will be available in April for US$600 (CA$730), click here. The external battery adapter will sell for $250 and $330 in the US and Canada respectively.